We are not starting being hungry again but we sit at the table full of food from yesterday again – it needs to be finished. Except Alex in pain rest of us is content and happy. My first shot, nobody collapsed, we have more photos that from yesterday’s Christmas, Alex is alive and getting better. I would like to thank my mom (former nurse) who took us to her job and we were watching her secretly giving shots to patients. It’s done – good reason for day-long celebration, relax and talk. We construct new alcohol beer-can stove and test it’s efficiency (boils 0.7l of water in 5min). In the evening we solve a mystery of disappeared bag with our rain equipment. We find it next to a neighbor house, all torn (but the clothes undamaged). The thief is running around with ears down and is looking how we are taking his catch back … dog-kleptoman :). Two more days and we are leaving Coihayque – many posters offering our bicycles for sale stay there and one great friend Boris. First day is mostly uphill on tarmac in beautiful nature and trying to escape a storm and against such a strong wind that we rather build the tent. We have company of young 21years old Australian cyclist who is exactly the type of hyper motivated traveler – one just wants her to shut up but is also thankful for the reminder how is to be excited by every small … thing. The luxury tarmac disappears in Cerro Castillo village (known for a citadel shaped mountain), we have gravel under the wheels and enter the less inhabited southern part of Chile. But the everyday company is unfortunately the rain – it’s raining almost every night and every morning we pack the tent wet. Days vary – nice, rainy, wind that it’s not even possible to push the bike, drizzling, fog, warm, cold … and sometimes all of it in one hour! We are changing clothes more ofthen than models :). The nature is getting it’s amount of water, it’s 31.12. and we are sitting in front of tourist office in Rio Tranquilo (calm river), surfing internet on free wifi and deciding what to do … camp and company or continue and safe time and money? The New Year starts with laundry, drying things which are wet and smelly after pisco we had in one of the waterproof bags (yes, it’s waterproof also the other direction :)). The biggest tourist attraction of Rio Tranquilo are beautiful marble caves formed by incredibly turquoise water in the lake. Jan doesn’t want to go for the tour because we need to wait for another people (min. number of people on the boat is 4). Considering all pros and cons we decide to return. After some waiting we get on the boat and what we see is truly amazing … Marble curved by water into arcs, caves, towers and surrounded by that awesome turquoise water. If there are places worth to see and spend money, this is definitely one of them! The morning is slow but the timing is perfect to meet Klaus who started early from Rio Tranquilo. We go with him the whole day and he tells many stories and information – he’s an experienced cyclist who did trip around the world and many “shorter” trips and is finishing the Panamerican highway now. Most of the time we stay next to the General Carrera lake which is even after 5th day still amazing – turquoise water, mountains with white caps – much much nicer that the know Titikaka lake in Peru/Bolivia! Next day we would like to start earlier, but destiny doesn’t like it. Everybody else is already cycling when we are trying to find solution how to fix our broken tent pole (the repair kit is a big fail – like for a different tent). We also fix torn panniers and realize that our racks are broken again and need to fix them too which creates another hour of delay. 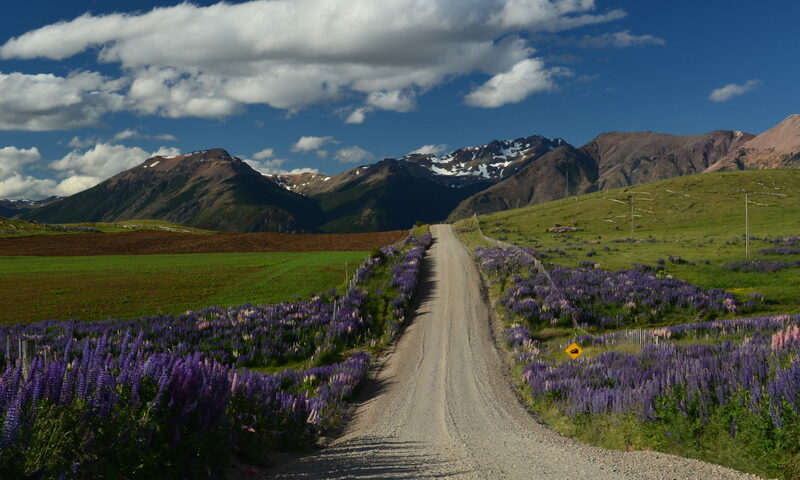 2 days we bicycle along the light-blue artery of the south on incredibly inclined roads, We eat many calafate (like blueberries on spiky bushes), have amazing views. We stop at the viewpoint to Rio Baker and Neff confluence and leave our fully loaded bicycles just leaned on to the gate while we go for 20min walk to the water (Patagonia is one of the safest parts of the world and who would like to bicycle on this kind of roads, no?). We are a little scared on the way back, when we cannot see the bikes where we’ve left them … OK, we have the passports and some cards and camera with us, we can survive the lost of the other things… Fortunately somebody just needed to pass the gate and moved the bikes a little from the way, so we can just think of how we would react and if really wouldn’t miss the things (I doubt it :D). In Cochrane we do shopping (they say it’s the last relatively cheap place), we meet cyclists and socialize in a camp. Carretera austral is an interesting place on earth … It’s so beautiful when sun is shining, one thinks he just found a paradise full of lagoons, forests, white mountains, waterfalls … and when it’s rainy and windy, it’s a mystical paradise on earth :). Just the never-ending fence along the road is weird – even the most remote lands is owned by somebody! We build the tent under the roof and because it’s still raining, we stay for 2 days. We write articles, relax (I’m taking antibiotics for my sore throat again), I almost burn my hair while flambing calafate and during a walk to a library (leaving all our stuff in the camp), we become victims of theft! We are making fun of it the whole way, but then we see that really somebody was stealing here … but we are missing just our old, destroyed, stinky gloves ( 3 of 4 of them :)). It’s funny, but probably some children wanted to have a souvenir. Anyway it was probably our destiny and we are happy we’ve lost just the gloves! It’s terribly raining when we are leaving this interesting village – normally one should stay under a roof in such weather and definitely not even think about bicycle. Unfortunately we are short on time and when we want to catch the ferry to Argentina, we need to move. First 2 hours we spent only in the village carrying the bikes up on never-ending stairs. But we invented perfect technique – I have a strap attached to the front rack and Jan lifts and pushes the loaded bike from behind. It’s like catching up months without gym and at the end we are soaking wet from the rain. After half an hour bicycling we have shoes full of water and also our technical rainproof clothes don’t work. In these conditions one would need a neoprene layer, rubber boots and plastic rain jacket to stay warm and dry – our gore-tex jackets let the water through after 15min of strong rain when we don’t just stay without movements. And then a steep uphill comes and we cannot pedal anymore – wet chains with the fine sand get stuck on the chainwheel and we can only push… The hitchhiking plans doesn’t work when there is no traffic at all – it wasn’t good idea to go in this weather. Car! Miracle! Stop! It stops! 🙂 In less than one hour and we are hanging our soaking wet clothes in the ferry waiting room. One cyclist told us about the military station here so we try the luck and we spend the night inside in warmth, with good food, hot shower and great company. 1. Even after sticking so many posters about selling the bikes and making big effort we still not have real buyers! Normal people at the end of honeymoon write facebook statuses like “last massage before we are returning” and we are thinking if we are going to inform somebody to search after us after couple of days … crazy! We are lucky and stop a truck. Even when there are some rests of dead sheep next to us, 10km uphill is a big help. The inclinations get better and we continue through beautiful valley next to a big river Mayer surrounded by white mountains. This way is longer and more difficult but it’s really nice here. We start to cook, hang our clothes around to dry and start fire next to which we can later nicely … suffocate from smoke! What kind of “architect” projected chimney here??? Everything smells like smoked sausage and because we cannot move the stove while it’s working we are crying and coughing till we finish our dinner. Then we try to extinguish the fire to lower our suffering from the smoke. Last night in Chile! In country which amazed us with its people and nature. Country which we put together with Cuba and Colombia on the top-list of our trip! Evit and Jan, I enjoyed this post – just randomly picked one to start with – and I will savor the other “chapters.” I will have so many more places to put on my bucket list now. Thank you for doing this, for sharing your trip. It will make a nice memento for you, too, of course, but you’ve made the special effort to put this into English and make this available to us English speakers, so I thank you for that very very much. You two are something else. I wonder what you are thinking of next in your lives…?